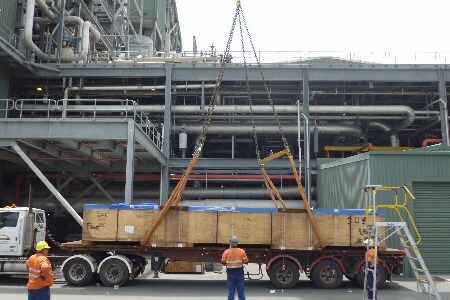 Green’s has completed the design, manufacture and shipment of 122 double coils for InterGen’s 850 MW coal fired supercritical power station in Millmerran, Queensland, Australia, which supplies enough electricity to power approximately 1.1 million homes. The power station burns around 3.6 million t of subbituminous coal per year from the nearby Commodore Mine in the Surat Basin. While this is an abundant resource that is easily transportable to Millmerran, it not only produces large quantities of ash when it is burned, it is highly abrasive which means that the boilers, burners and ancillary equipment at the power station need to be particularly robust. The Millmerran Operating Co. (MOC) invited a number of potential suppliers to propose designs that would increase the life of their system, improve performance and make it more resilient. Green’s proposed several options including its proprietary finned tube technology, rather than the plain tubes that are used in its existing system, which is particularly suited to maximising the waste heat recovery from power station boilers. This results in reducing the amount of fuel used as well as cutting costs and emissions and is well suited to heavy fouling applications. Green’s engineering team used a range of tools and modelling software to propose the optimum solution that would meet all of MOC’s requirements. Some of this work was carried out in partnership with Green’s Australian agent B&PPS and Queensland University. It was then manufactured at Green’s factory in Wakefield in Yorkshire, UK.